Time to get your digital savvy on point with your design savvy! Developments in mobile, online, video and virtual technologies have created a world of new opportunities for design professionals. Discover the best new apps and platforms in the market that will help you grow your design business. Whether your goal is to optimize project management or accounting functions, more easily source new products, or go under the hood of social media (can we turn “likes” into real contacts and business opportunities? 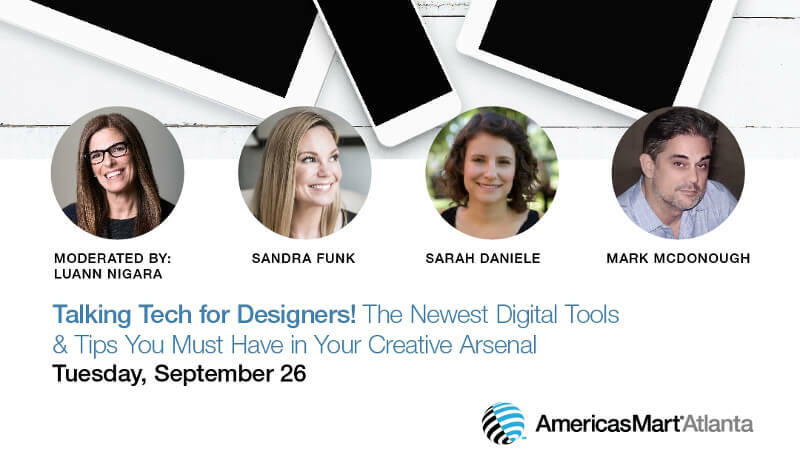 )—don’t miss this crash course for designers—without all the stuffy tech talk. Join LuAnn Nigara, host of A Well-Designed Business® Podcast, who will lead a thoughtful panel discussion with digital expert and brand-builder Mark McDonough of Tastefully Inspired blog, Sarah Daniele, co-Founder & CEO of Mydoma Inc., an industry-leading project management and client collaboration software tool for interior designers, and Sandra Funk, principal designer of House of Funk, a full-service and online interior design firm with offices in NY and NJ.